To accurately forecast the weather, you first need lots of data — not just to train your forecasting models but also to generate more precise and granular forecasts. Typically, this has been the domain of government agencies, thanks to their access to this data and the compute power to run the extremely complex models. Anybody can now buy compute power in the cloud, though, and as the Boston and Tel Aviv-based startup ClimaCell is setting out to prove, there are now also plenty of other ways to get climate data thanks to a variety of relatively non-traditional sensors that can help generate more precise local weather predictions. Now you may say that others, like Dark Sky, for example, are already doing that with their hyperlocal forecasts. But ClimaCell’s approach is very different, and with that has attracted as clients airlines like Delta, JetBlue and United, sports teams like the New England Patriots and agtech companies like Netafim. And that’s where ClimaCell’s main innovation comes in. Instead of relying on government sensors, it’s using the Internet of Things to gather more weather data from far more places than would otherwise be possible. This kind of sensing technology could turn millions of existing connected devices — like cell phones, connected vehicles, street cameras, airplanes and drones — into virtual weather stations. It’s easy enough to see how this would work. If a driver turns on a windshield wiper or fog lights, you know it’s probably raining or foggy. Often, these cars also relay temperature data. If a street camera sees rain, it’s raining. What’s more complex is that ClimaCell has also developed the technology to gather data from how atmospheric conditions impact the signal propagation between cell phones and their base stations. And to take this one step further — and beyond the ground level — it has also figured out how to gather similar data from satellite-to-ground microwave signals. 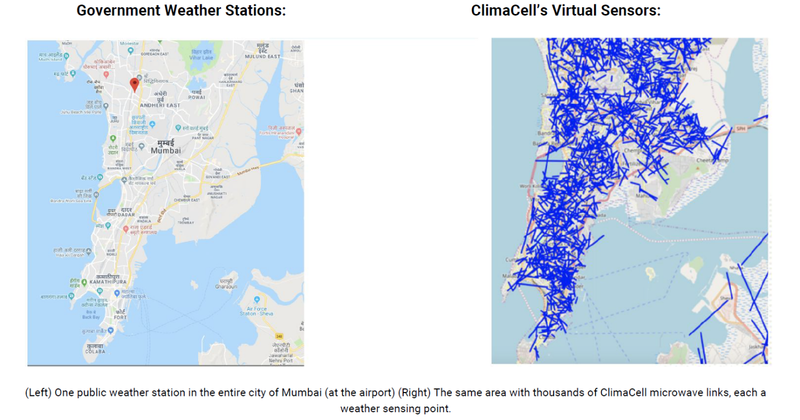 Using all this data, ClimaCell is providing its customers, like airlines, ridesharing companies and energy companies, with real-time weather data and forecasts. Using all of this data the company also recently launched flood alerts for about 500 cities that can provide 24 to 48-hour warnings ahead of major flood events. To do this, the company combined its weather data with its own hydrological model. For now, most of ClimaCell’s business model focuses on selling its data and predictions to other businesses. The company plans to launch a consumer app in May, though. I got a sneak peek of the app; while I can’t vouch for the forecasts, it’s a very well-designed application that you’ll probably want to look at, no matter whether you’re a weather geek or just want to see if you can get a quick bike ride in before the rain starts. Why a consumer app? “We want to become the biggest weather technology company in the world,” Elkabetz said. To get to this point, the company has raised a total of $68 million to date from investors that include Clearvision Ventures, JetBlue Technology Ventures, Ford Smart Mobility, Envision Ventures, Canaan Partners, Fontinalis Partners and Square Peg Capital.